Pictures and images enhance your maps and expand the types of information you can use in your work. Maptitude mapping software lets you use one or more pictures, satellite images, aerial photographs, or scanned documents as layers in your maps. They can improve the appearance of your maps, add to the depth of information displayed there, and provide a basis for editing and updating your map files. You can use raster images such as satellite or aerial photographs directly in your maps. Maptitude can display TIFF, GeoTIFF, JPEG/World, JPEG 2000, MrSID, SPOTView, Orthophoto, and ECW image files (for a full list see the Maptitude Data Access page). Maptitude makes it easy to access free imagery from the Internet for any location in the world. Maptitude Web Map Layers give you access to satellite and imagery from several internet sources (Figure 1). Web Map Layers automatically update the image resolution and location as you move about your Maptitude maps. Maptitude also includes the WMS Image toolbox that lets you download aerial photos, maps, and topography with the click of a button. The Google Earth toolbox lets you use Google Earth images with your maps, add your maps to Google Earth, and synchronize the scales of Maptitude with Google Earth maps. These images can be used as a means of reference or in conjunction with the map editing tools to create or edit geographic files. After you display an image, you can use the geographic editing tools to trace new map layers such as building footprints (Figure 2), new subdivisions, or manhole covers. Most images have the information that Maptitude needs to display them at the correct location. Maptitude even has tools for images without this information, allowing you to register (georeference) TIFF, JPEG, JPEG 2000, and MrSID images to indicate their true locations on the map. Maptitude lets you manage large sets of images. 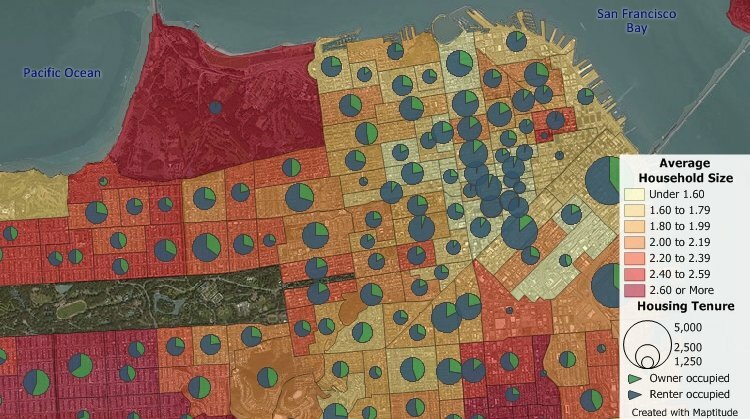 You can use the Image Librarian to create Image Libraries, and then add one or more Image Libraries as layers in your map. 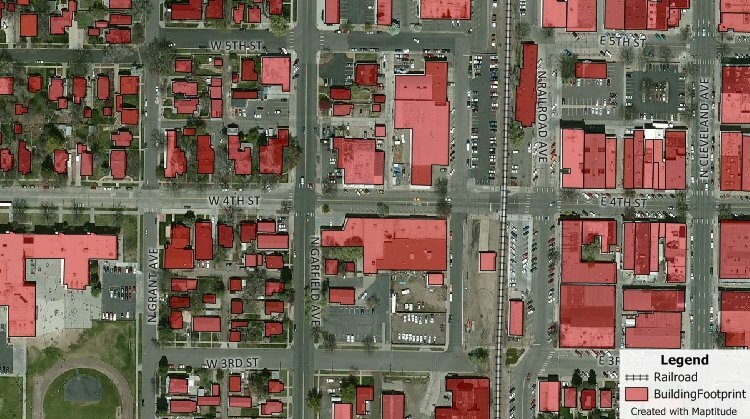 Maptitude can now download imagery for anywhere on Earth with the click of a button. These images are accessed from WMS servers, which are on-line databases of aerial imagery and maps. As long as you have Internet access, you can use the toolbox to download images. Once accessed, these images can be saved as layers to be used in any on-line or off-line map. There are many OpenGIS Web Map Service (WMS) servers. Maptitude provides several by default, and you have complete control over which services are listed. Each WMS server can have one or more layers, and you can choose the layers that you want to add to your map. For example, you can add flood plain zones or high water marks from FEMA (Figure 3) or you can even add real time data such as air temperature or weather conditions from NOAA. If you have installed Version 4.0 or later of Google Earth and you have internet access, you can use the Google Earth toolbox to get in image from Google Earth that you can add as a layer in your map. FIGURE 1: With an internet connection, you can download aerial imagery and topographic maps with a single mouse click. Opacity settings in Maptitude allow you to add semi-transparent layers over your imagery. FIGURE 2: Use aerial and satellite images for creating and editing geographic files. For example, trace building outlines to create a footprint database. 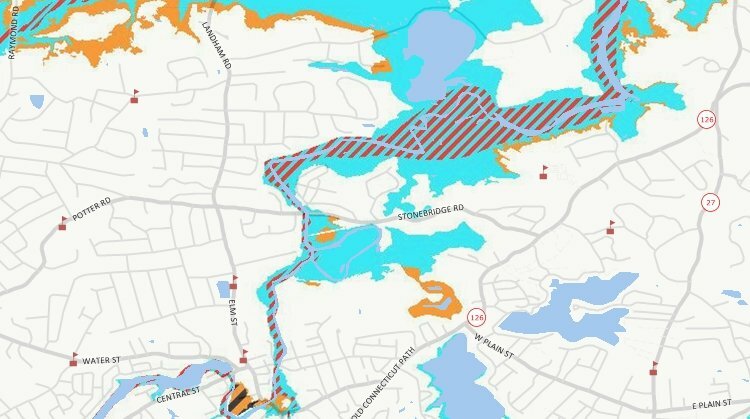 FIGURE 3: Use Maptitude satellite image download software to download WMS maps from internet sources such as this flood hazard zone image from FEMA.